The old Beacon Climbing Centre had been in the Marconi Building in Ceunant for some 18 years. This was a reasonable climbing wall, but it was very out of the way, a bit rundown and in need of an update. This old centre has now shut and the operation moved to a former TV studio on the Cibyn Industrial Estate near Caernarfon. As the new location is just off the main A4086 road from Llanberis, the Beacon Climbing Centre is now brilliantly placed for climbers rained off the mountains and crags of Snowdonia National Park. 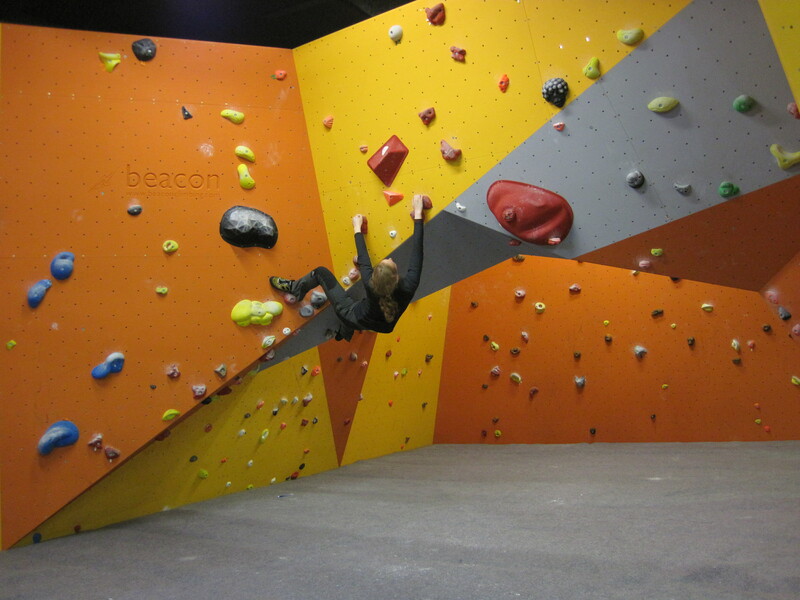 With a sister company that has been designing and building climbing walls across the UK for over 16 years, you would expect the new Beacon Climbing Centre to be good. It doesn’t disappoint. The open plan climbing space is stunning. 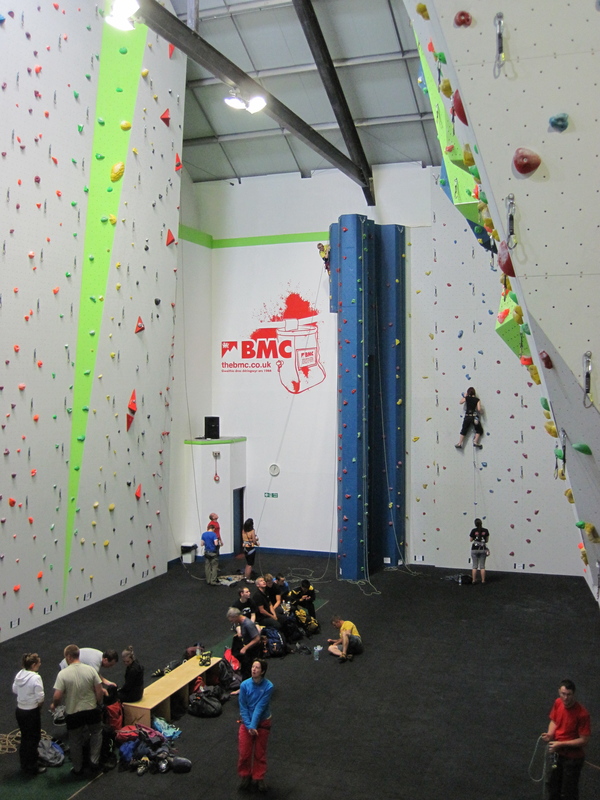 There are 17m high lead climbing walls, that come with a maximum 7m overhang, as well as several other walls with varying angles and a mix of lead and top-roped climbing. A mezzanine level running around this main space includes a viewing balcony and cafe, kids area and bouldering room. While the climbing is extensive, the bouldering is currently limited to a single room with an arch and to a traversing wall. However, another bouldering area is due to open this autumn. The climbs and boulder problems I tried were interesting and engaging. The quickdraws on the lead walls were also reassuring frequent. My fiancée and I found the climbing to be quite strenuous, with many routes and problems learning back or overhanging and few slabs. Whether this matters is probably a matter of taste and how strong your forearms are, but the Beacon is certainly a good place to go to get a workout. What particularly impressed me about the Beacon is how child-friendly it is. 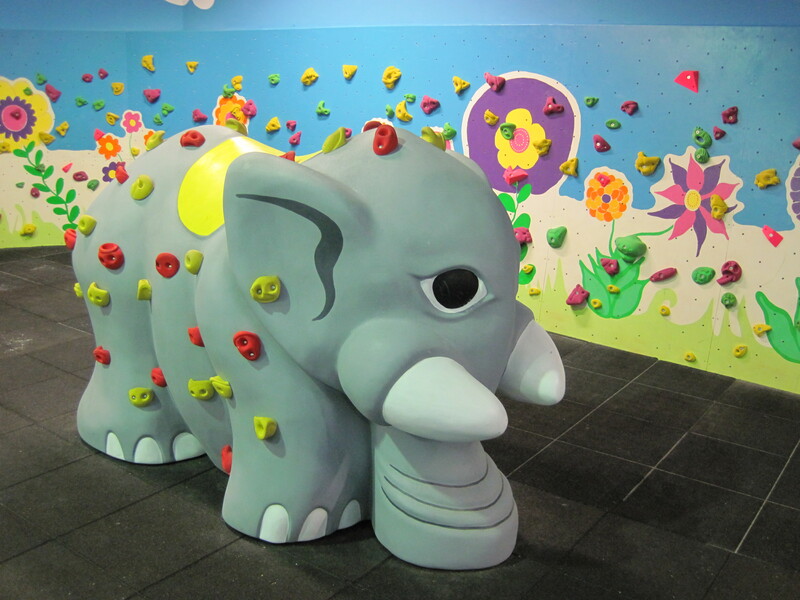 The dedicated kids area included a bouldering area and the brilliant Tommy the elephant – basically a model elephant covered in climbing holds. This kids area is next to the café. 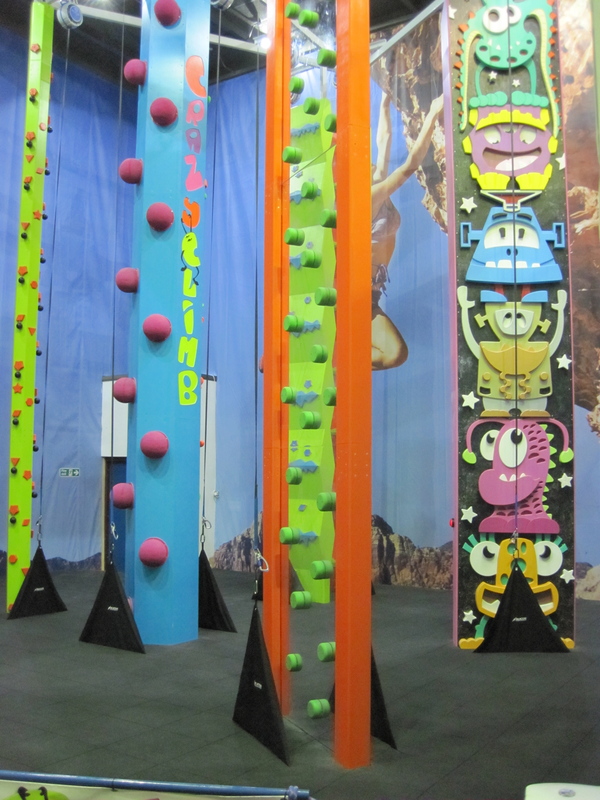 Even more imaginative than Tommy is the CrazyClimb area that can be rented for kids parties and school groups. This is an area with 11 trippy, brightly coloured climbing challenges that play around with shapes, angles, patterns and perspective. Each of these challenges are protected by autobelay devices. It looks amazingly fun. I know lots of climbers who have become parents in the last few years and want both to keep climbing themselves and to introduce their kids to the sport. What the Beacon provides are just the sorts of facilities walls should be providing for these customers. Other facilities include a branch of the V12 shop, a lecture theatre and a meeting room. There is also a dedicated area for practising abseiling (rappelling if you are American) that was being used when I was there to practice self-rescue. This is a useful touch that I’ve not seen at other walls. Unfortunately, there are a few, niggly things at the Beacon that could be better. Instead of lockers there cubbyhole type shelves that ran out when I was there and led to bags and shoes being spread out on the floor. The café was overwhelmed during lunch, but this is probably just one of those things that happens when a place is new and trying to find its feet. The car park is a fair size, but overflowed into the road to the centre when I was there (admittedly, this was during the school holidays). Generally, the new Beacon Climbing Centre is amazing and the most child-friendly climbing wall to which I have ever been.